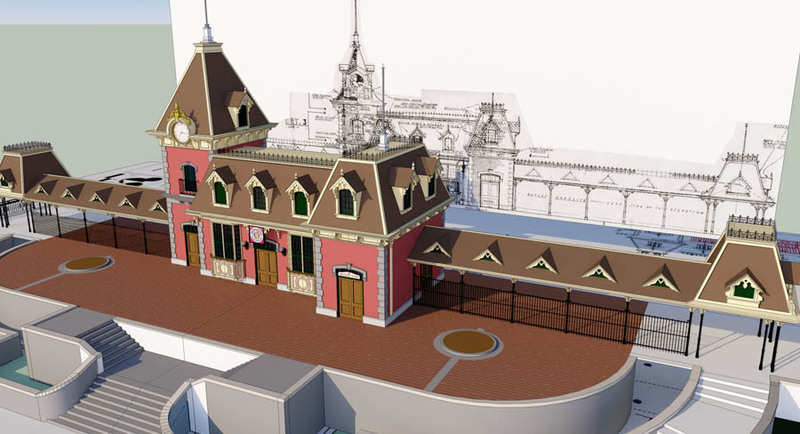 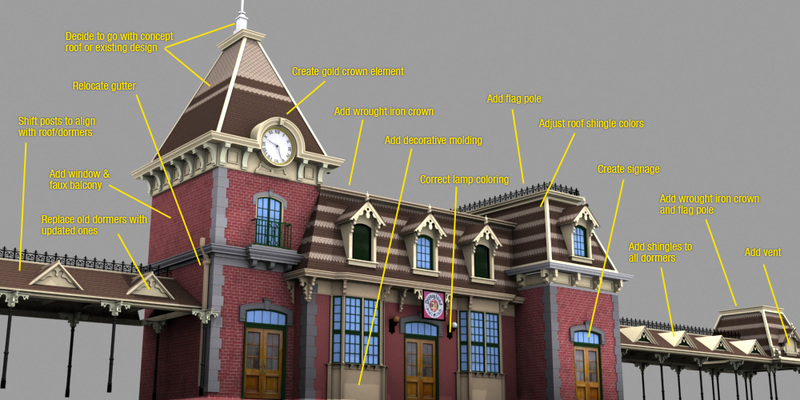 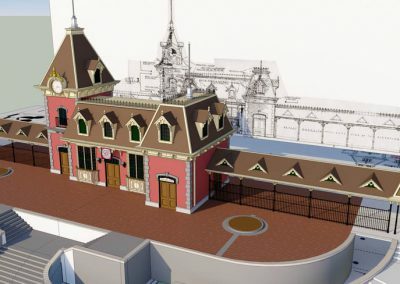 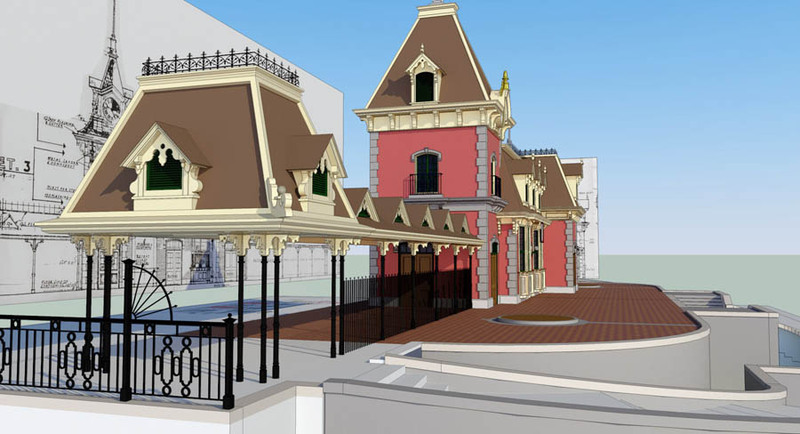 From Wikipedia: This beautifully designed train depot is “in the Queen Anne style with mansard roofs, widow’s walks, dormers, and a clock tower.” It’s simple, but yet beautifully detailed in all the right places, and marks the entrance to the happiest place on Earth. 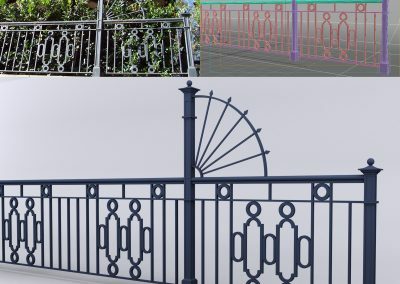 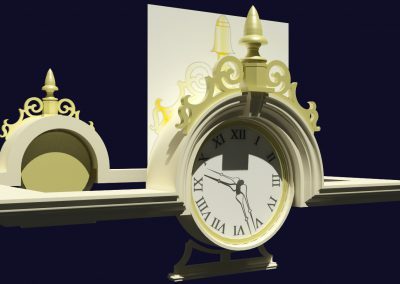 This design has always been a favorite of mine, so much that I chose it as my very first Disneyland design (2nd Disney park design behind the Grand Floridian Resort & Spa.) 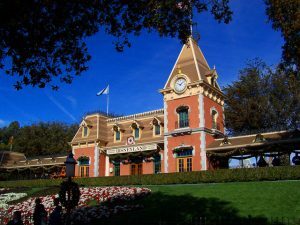 I’m a huge railroad buff and make sure to ride the “grand circle tour” several times during any trip to the park. 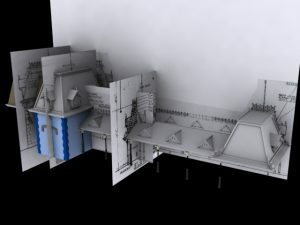 From the very beginning, I had much more reference material to work with, including personal photos and a blueprint copy that took me hours to scan and piece together. 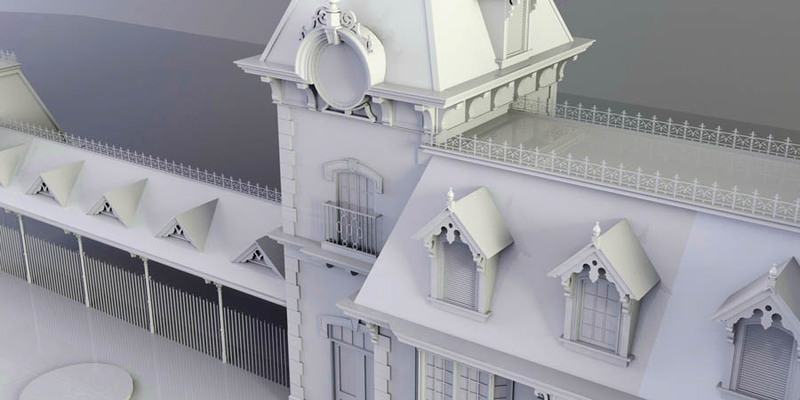 I set up reference planes inside of 3dStudioMax and worked on each section without giving much thought to true detail or how many elements were copies of each other. 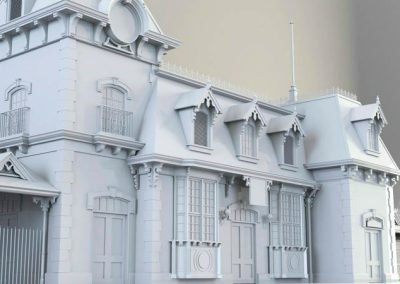 I learned a great many things about how to organize a scene, speed up my modeling without sacrificing detail, and render interesting viewpoints to attract new viewers on social media. 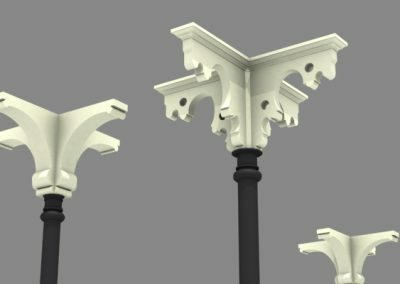 Basically work smarter not harder. 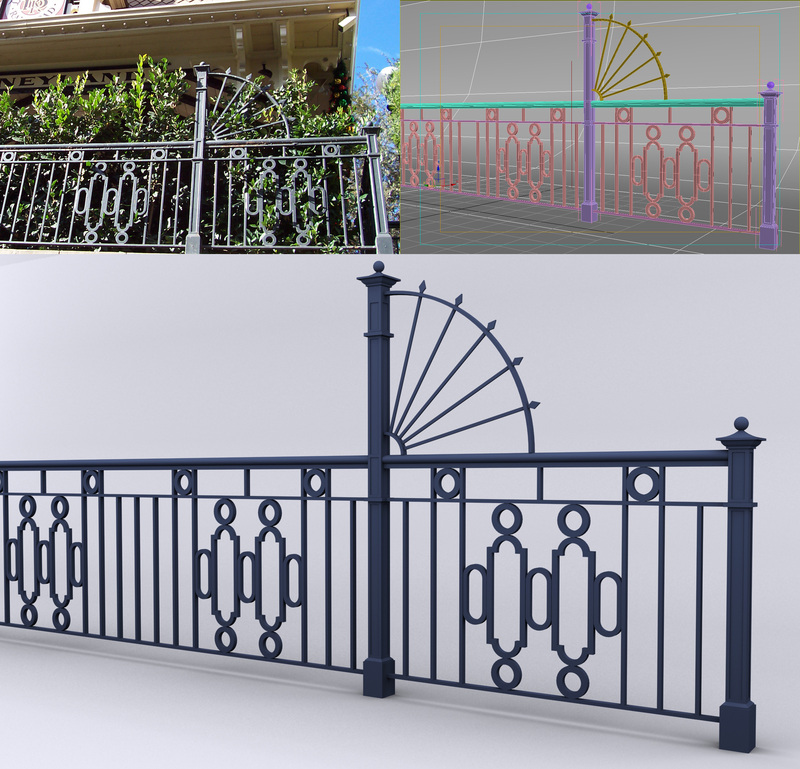 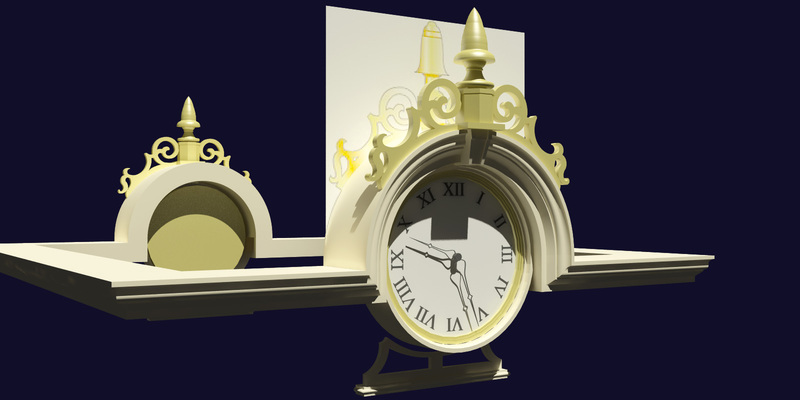 Starting in 2014 I began to remodel several pieces of architecture using another program: SketchUp. 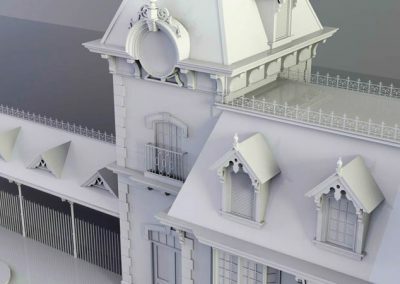 This gave me a chance to use new tactics and tools to add even greater detail when appropriate (read: accuracy) and remove extra detail that only slowed down navigation and didn’t add anything to the render or animation, such as the wrought iron detail capping each roof. 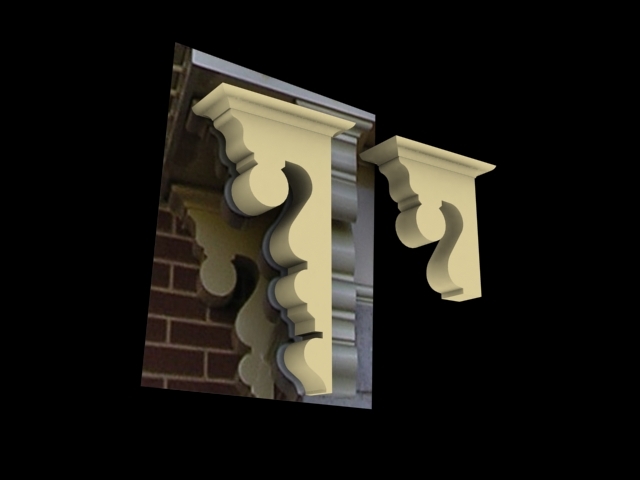 Because it’s painted black and doesn’t show shadows well, there was no need for the object to be fully 3-dimensional. 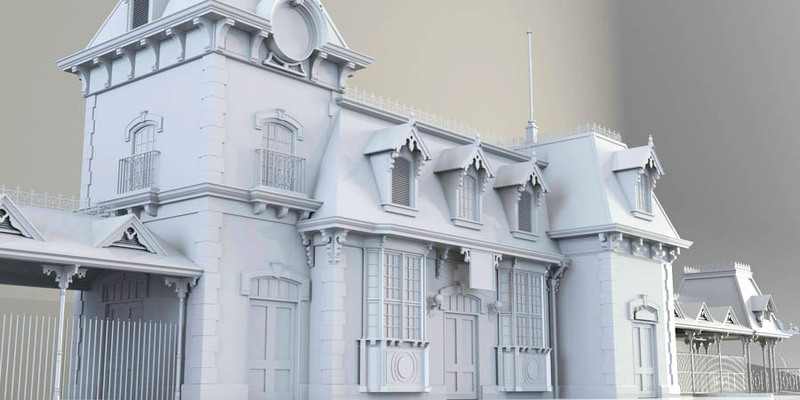 By having it display as a 2-dimensional object, it gave nearly the exact same impression of detail from a distance but saved tens of thousands of faces and vertices. 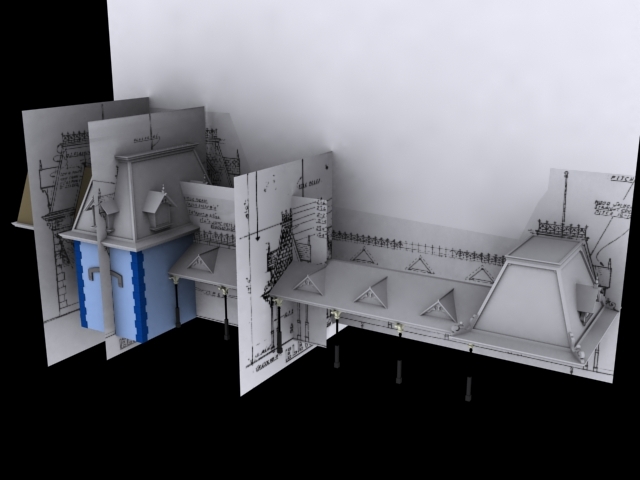 A few fun facts: First, the clock tower roof design in the original blueprint differs from the finished product by quite a bit. Second, this was the first project that I used photographs of textures and structural elements as applied materials on the model. 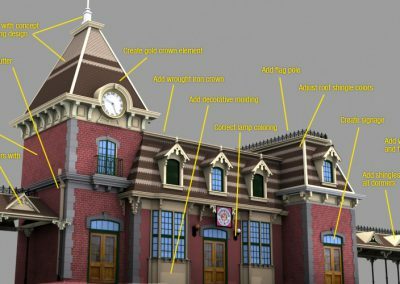 Most of the time I find the entrance to the station rather empty of guests, so it can be fairly easy to take a clear, straight-on photo to use in the scene. 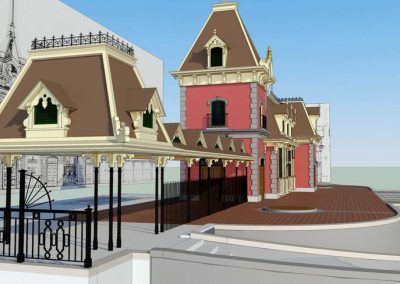 And lastly, if you ever have a chance to ride the Lilly Belle Presidential Train Car that is added to the end of the consist, make it happen. 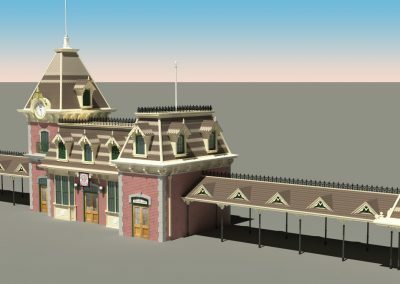 It is an absolute treat!